In my most recent article, I discussed the cross-container DML statement, which is a convenient way for the Application Root administrator to perform DML operations on a table in any application PDB within the application container, without connecting to it or creating corresponding database link. In this article I will discuss conversion of a regular PDB to an application PDB so that applications that are already installed in it can also take advantage of application containers. Here, we have an Oracle database 12.2.0.1 CDB called orclcdb as shown. Within this CDB, besides CDB Seed PDB pdb$seed, we have a regular PDB called orclpdb which supports its own application. Also, we have created an application container sales_app_root for the sales application (sales_app) of an organization. The application container sales_app_root houses four application PDBs north_app_pdb, south_app_pdb, east_app_pdb and west_app_pdb which support the sales_app application for various regional offices of the organization. 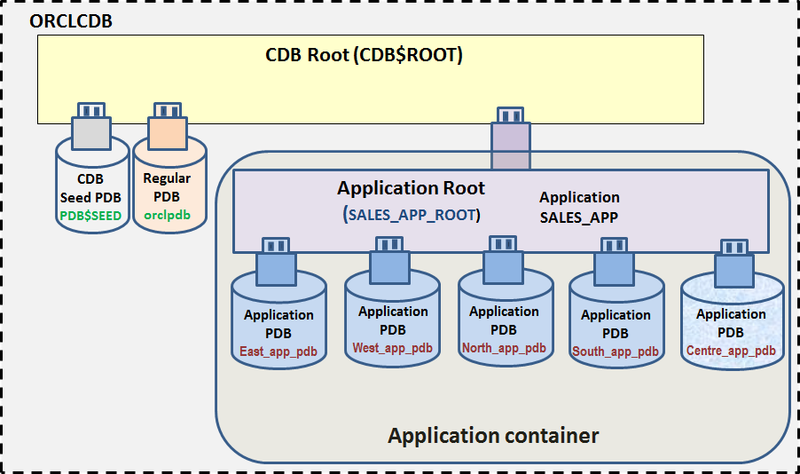 While sharing the structure of the metadata-linked customers table stored in the application root sales_app_root, each application PDB can store region-specific customer data in the table. It is desired that the regular PDB orclpdb, besides supporting its own application, should also be able to access common application objects of the application sales_app. In order to fulfill this requirement, we will clone the regular PDB orclpdb to application PDB centre_app_pdb within the application container sales_app_root as shown below so that common application objects of the sales_app application are accessible to it. Clone the regular PDB orclpdb into the application root sales_app_root. as application PDB centre_app_pdb. Violations will be reported during the opening of application PDB as application sales_app in the application root does not exist in application PDB yet. Connect to the new application PDB centre_app_pdb and execute the $ORACLE_HOME/rdbms/admin/pdb_to_apppdb.sql script so that common application objects are accessible in the application PDB. For example, the common application user sales_app_user that exists in the application root is marked as common in the plugged application PDB centre_app_pdb. The script automatically synchronizes the application PDB with the application root. Let us first connect to CDB orclcdb and verify that there is one regular PDB, orclpdb, in this CDB. 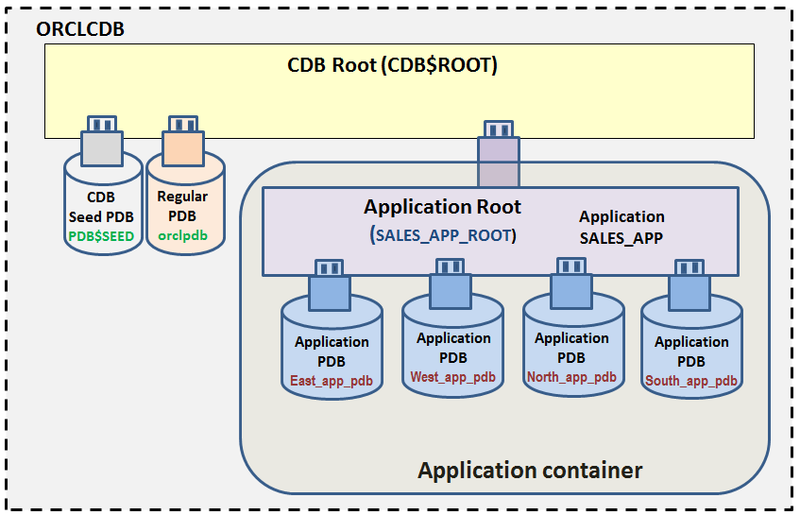 Note that there is one application container sales_app_root in this CDB. Connect to application root sales_app_root and note that there are four application PDBs (north_app_pdb, east_app_pdb, west_app_pdb, south_app_pdb) ) associated with it. Besides an implicit application, another application sales_app is currently installed in this container. All the application PDBs are synced with the application sales_app version 1.0. Let us check the common objects currently in the application sales_app. There is a metadata-linked common application table sales_app_user.customers with structure as shown. Let us create a local user l_user and a local table l_user.ltab in the regular pdb orclpdb to represent an application supported by it. In order to clone the regular pdb orclpdb as an application PDB centre_app_pdb in the application container sales_app_root, let us open orclpdb in read only mode. Create a folder to house datafiles for the new application PDB centre_app_pdb and clone the regular PDB orclpdb as application PDB centre_app_pdb in the application container sales_app_root. When we try to open the newly created application PDB centre_app_pdb, it opens with a warning. The content of the view PDB_PLUG_IN_VIOLATIONS view explains that the script pdb_to_apppdb.sql script must be executed on the converted regular PDB centre_app_pdb for it to become a full application PDB so that the application sales_app is accessible in it. Non-Application ERROR     Non-Application PDB plugged in PENDING   Run pdb_to_apppdb.sql. tion PDB                  es pdb_to_apppdb.sql be run. Note that while the local user(l_user) / table (l_tab) created in the parent regular PDB orclpdb are accessible in the newly created application PDB centre_app_pdb, the common application table sales_app_user.customers for the application sales_app is not accessible yet because the application PDB centre_app_pdb has not been synchronized with the application root sales_app_root. Let us execute the conversion script pdb_to_apppdb.sql on the newly created application PDB centre_app_pdb. As I connect remotely to centre_app_pdb and execute the script, the script fails on a step and returns me to the OS prompt. After reconnecting to the application root sales_app_root, I note that centre_app_pdb is open in migrate mode. After various repeated trials, I realized that there is a bug. The script pdb_to_apppdb.sql fails when it is executed after connecting to the application PDB centre_app_pdb remotely. Connection using “Alter session set container ..“ results in successful execution. Let us reopen the newly created application PDB centre_app_pdb to bring it out of RESTRICTED mode. The script automatically synchronizes the application PDB with the application root. Hence, we have successfully converted a regular PDB orclpdb to an application PDB centre_app_pdb in the application container sales_app_root so that besides supporting its existing application(s), it can take advantage of the common application objects of application sales_app in the application container as well. A regular PDB can be converted to an application PDB so that applications already installed in it can take advantage of application containers. Clone / Plug the regular PDB into application root as application PDB. Violations will be reported during the opening of the application PDB as the application in the application root does not exist in the application PDB yet. -- Find out various versions of application SALES_APP and synchronization status of various application PDBs with it. Execute from application root. -- Find out objects belonging to sales_app application.